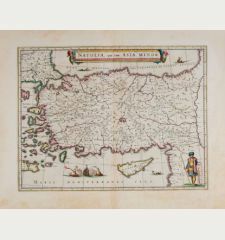 Antique map of Famagusta. Printed in Venice by G. F. Camocio in 1571. A very rare, early view of Famagusta in Cyprus from Camocio's Isole Famose. 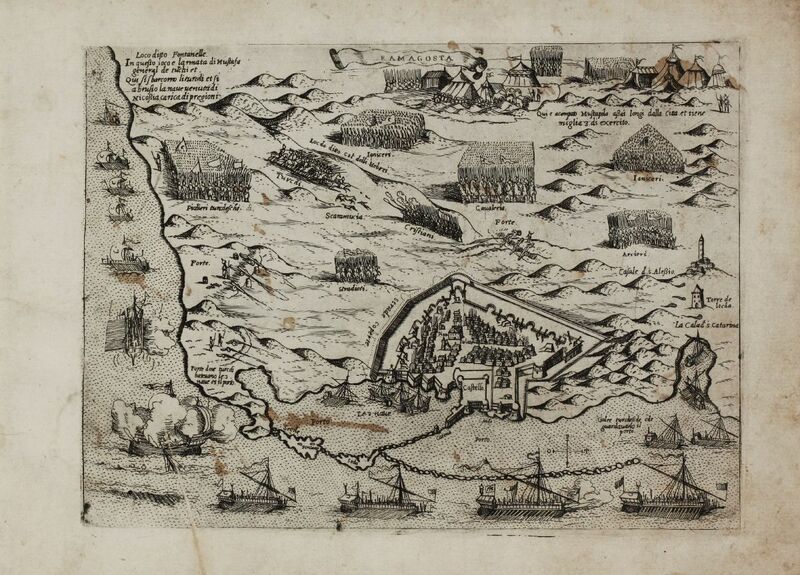 Showing the siege of Famagusta by the Turks in 1571. This copy is printed from the first state of the plate, without the number in the lower right corner. It is extremely rare to find this sheet on the market. The plan is an accurate outline of the fortified town and the palazo and the Piaza are correctly positioned. The citadel is marked simply as Castello. There is no indication of orientation, but north should be in the right bottom corner. At the top left, a note tells us: Loco ditto Fontanelle. In questa e larmata di Mustafa general de turchi et qui si sbarcono li turchi et si a brusio la naue uenuta di Nicosia carica di pregioni. At the top right, another note states: Qui e acamparo Mustapha assai longi della citta et tiene miglia 3 di exercito. The several formations of the besieging forces are inscribed, Piadieri turcheschi, Turthi (cavalry in attack) Caualeria (in formation), Ianiceri (two formations), Arcieri, Stradioti (small cavalry formation, centre left). In their midst a sortie of foot-soldiers with their guns blazing, is marked, Cristiani; they advance towards the attacking Turchi (cavalry). Between them, two horses, their riders dead on the ground, are marked, Scaramutia. A location near by is marked as Loc(o)do ditto col(le) delli Hebrei. At the bottom right, an inlet of the outer port is marked, la cala d(i) S. Catarina; above it, a small tower is marked Torre de loc(an)da; above this we have the Casale di S. Alessio. On the left, by the sea, two formations of field-guns are blazing towards the town, one of them marked Forte and the other (bottom), Forte dove turchi bateuano le 3 naue et il porto. In the inner harbour, by the walls, are le 3 naue. At the entrance to the outer harbour are the Galee turchesche che guardauano il porto. In the open sea there are several ships, some with their guns blazing. Those with their sails up (top left), bear crescents on their sails. This pictorial representation of the siege, is based on contemporary amounts, in its main features. There is no imprint, but the workmanship of the engraving appears to he similar to the siege of Nicosia. 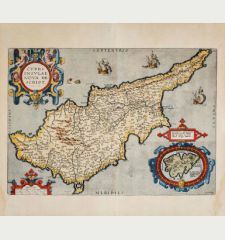 Famagusta fell to the Turks on the 1st of August, 1571. The copper-plate must have been made at that time. 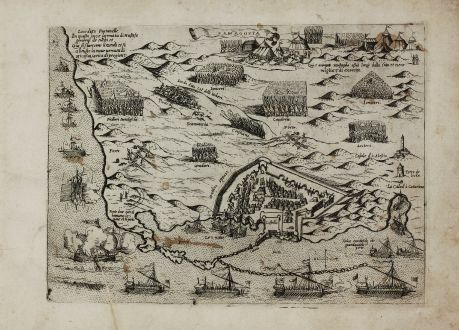 Many other maps, plans and bird's-eye-views of towns and fortresses around the eastern Mediterranean, with pictorial representations of their sieges by the Turks are collected in the above editions of the Isole famose, which could actually be called a war Isolario. They were the means by which a wider public could be informed of what was happening on the battlefields. For our purpose we shall further quote here the descriptive note of one of the plates depicting the sea-battle of Lepanto, found in several editions of the book. 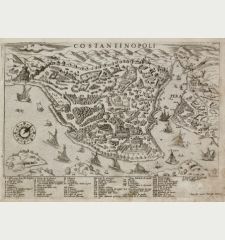 It is number 38 in the editions with the engraved numbering: Il uero ordine della due potente armate Christiana et Turcha nel modo si apresentorno alla loro Battaglia fatta sotto li 7 Ottobrio 1571 al colfo di Lepanto ... In Venetia Apresso Gio. Fran. Camocio MDLXXI. This illustrates how soon these informative sheets were made and issued to a hungry public, and supports our view about the dating of the undated Cyprus items. The Italian atlases of the 16th Century are among the much sought after cartographic rarities. 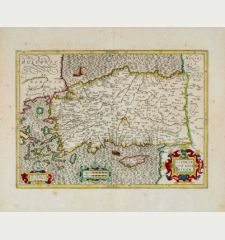 Besides the so-called Lafreri atlases, a compilation of individual maps of various sizes, the Venetian publishers Camocio and Bertelli issued a few atlases with maps of uniform size and style. 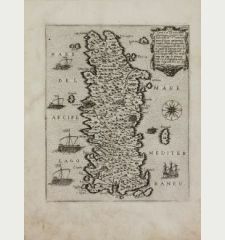 Isole Famose porti, fortezze, e terre maritime is one of the most important of these atlases, issued first by Camocio in 1566. 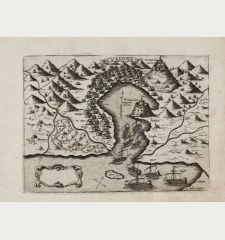 It comprises a collection of maps of the areas under the influence of the Venetians. Shown is the situation during the siege of Vienna in 1566, and the battle between the Venetians and Turks in the Mediterranean during the years 1570-1573. Mainly included are maps of the Mediterranean coasts, the main islands, and city views. 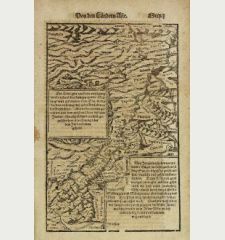 The atlas was published between 1566 and 1574 by Camocio without a title, after 1575 it was issued by Donato Bertelli with a printed title, also printed from the original plates. With original wide margin, which is rare, since sheets from Camocio's Isole Famose often cut along or within the plate marks. Printer crease in lower left side. Old ink scribbles on back side, resulting several brown spots within the image. Four small worm holes. Some staining mainly in margin. A good and strong impression. Giovanni Francesco Camocio was active as map publisher in Venice between 1558 and 1575. He was one of the most important mapmakers of the Lafreri-school. 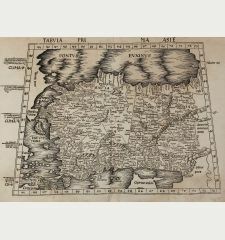 During the short period between the publication of Sebastian Münster's Geographia (1540) in Basel and Abraham Ortelius Theatrum Orbis Terrarum (1570) in Antwerp, Italy was the most important place of map production in Europe. The output in Rome and Venice was no less than 660 different maps of the world, which were based mostly on large woodcut maps. 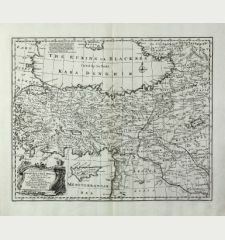 These Italian copper engraved maps were used, among others, by Mercator and Ortelius as templates. 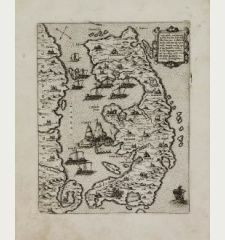 The individual maps of different formats were mostly compiled at the request of the buyer and bound by expanding the margin of the smaller maps. For the resulting bound collection of maps, the name Lafreri-Atlas has established. Besides the eponym Antonio Lafreri and Camocio, we have to mention Bertelli, Duchetti and Forlani, which also published bound collections of maps. As the most important representative of this period, the Venetian cartographer Giacomo Gastaldi overshadowed his combatant in volume and importance. 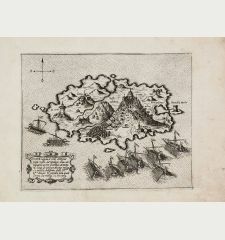 Besides Camocio's single-sheet maps of the continents and the world, he published an Isolario, a collection of island maps and plans of harbour. 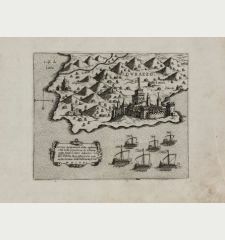 It was published between c. 1566 and 1574 without a title, after 1575 with the title Isole Famose Porti, Fortezze E Terre Maritime by Donato Bertelli who published the plates under his name after the death of Camocio.